I’m a big fan of Chloe Coscarelli’s previous cookbooks—Chloe’s Kitchen and Chloe’s Vegan Desserts. Everything I’ve ever made out of those cookbooks turns out delicious. I made her pumpkin cinnamon rolls of Thanksgiving dinner last year where I was the only vegan, and the omnivores raved about the cinnamon buns, begging to take some rolls home. As some of you know, I love Italian food. Lasagna, pasta, ravioli, eggplant parmesan, you name it. It’s part of the reason I loved Garfield so much. He understood the power of lasagna. So when Chloe, a bonafide Italian, came out with Chloe’s Vegan Italian Kitchen, I was overjoyed. I bought it while on vacation in Portland at Herbivore and have been drooling over it ever since. I want to make every single recipe, but I started with the Pizza Margherita. My father-in-law was in town, and he’s notoriously picky about food. He loved this pizza! 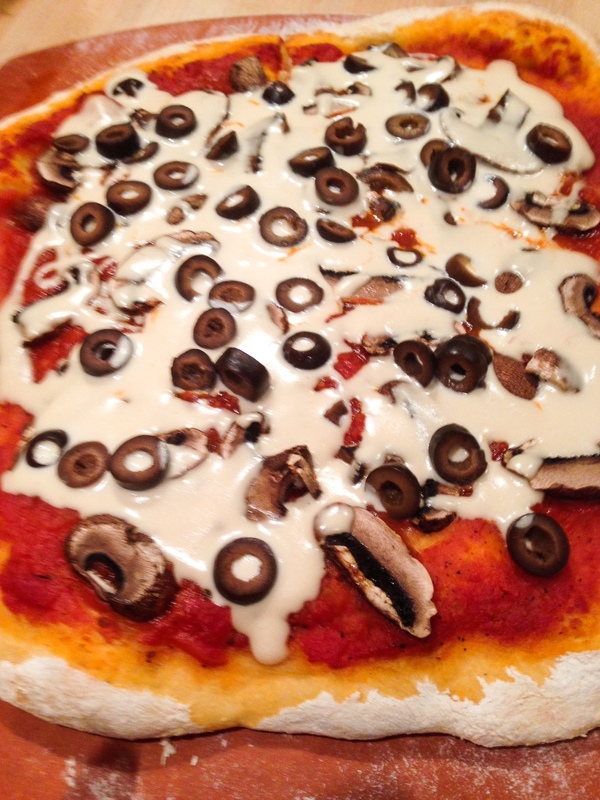 The mozzarella cheese sauce was easy peasy to make, and we added our own toppings. (I must confess that I bought the dough from Trader Joe’s!). We had leftover mozzarella sauce so we added it to a marinara sauce to make it deliciously creamy. Put it on sandwiches. We basically ate it on everything. These are the recipes you want to make to impress omnivores, and they’re super simple to make. Grab a copy here. Yum! The Pasta Carbonara with Shiitake Bacon looks fantastic. Hope you get her cookbook for Christmas. It’s a great resource, just like her other cookbooks.